We are proud to offer bespoke, handmade, alternative invitations and decorations for your wedding or special occasion. A UK based company committed to providing excellent service and offering products unrivalled in quality and design. 3.Place your order and checkout! 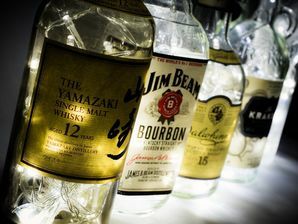 ​Located in the West Midlands, we set up business following our own wedding celebration when we designed our “Signature" style message in a bottle invitation. The feedback was fantastic and our guests still have their message bottles as a keepsake displayed in their homes. We wanted to provide a personal service to our customers with a bespoke product that sets their event aside from the crowd and give their guests a personal gift instead of just a generic invitation. 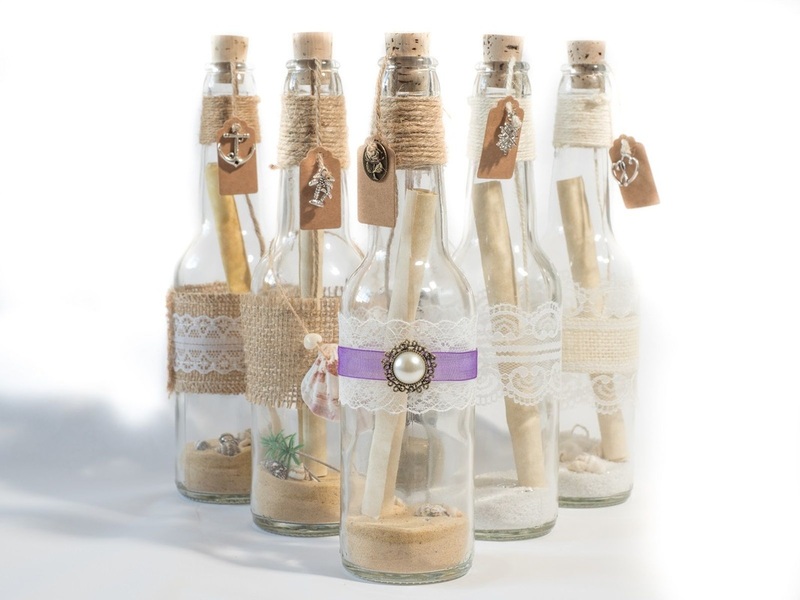 Our Message in a Bottle invitation designs are suited for all occasions including Weddings, Birthday Parties, Corporate Functions and Conventions. We would be very suited to destination weddings, themed weddings (such as our own pirate theme!) and other Nautical inspired events- please feel free to email us if you have any specific requirements. 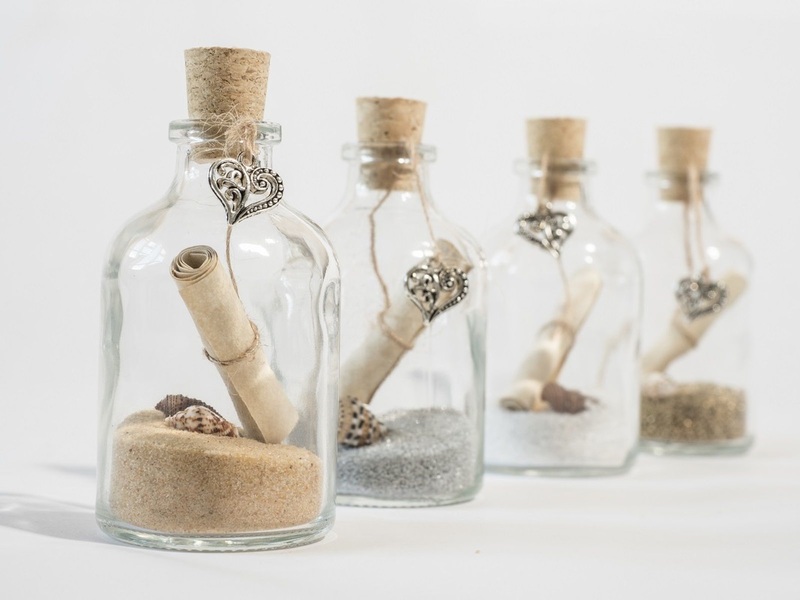 ​We also offer mini message bottles which are perfect for save the dates or wedding favours and thank yous. Enjoy looking around and be sure to contact us if you have any questions...! We've updated the paper scroll designs for our popular message in a bottle style invitations, save the dates and thank yous. As always we are always happy to discuss your ideas for custom-made designs. We are proud to say that once again our products have caught the eye of bridal experts. We were contacted by County Wedding Magazines who chose to feature our Vintage Message in a Bottle in an article about "thoughtful thank you buys for bridesmaids". We've been featured in a blog by Bouquet & Bangles. They were delighted with our "Elegance" Message in a Bottle invitation and loved our "Vintage" style save the date bottles. Thank you Bouquet & Bangles! As well as being busy writing our own blog we were asked to be a featured author by Marry Me Magazine. Check out our blog on wedding planners. ​Send in your feedback! We love to hear success stories from your own special day, please feel free to email us at contact@inviteinabottle.co.uk if you would like a mention and a picture on our website!